Multifunctional fall arrester device, weightless, handy to carry and to work, and developed to grip also on dirty or icy ropes. Multifuctional fall arrester device, weightless and equipped with webbing sling, not removable, and terminal connector. Detachable fall arrester device entirely made of stainless steel with solid and durable costruction; it can be manually stopped on the rope. Tied-on fall arrester device with solid and durable construction, and equipped with webbing sling, not removable, and with terminal connector. Removable fall arrester ideal for use with life lines made with stainless steel cable Ø 8 mm. 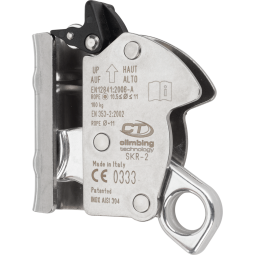 Removable fall arrester and it is ideal for use with galvanized steel cable Ø 8 mm. Removable fall arrester device completed with shock absorber; it is ideal for use with life lines made with stainless steel cable Ø 8 mm. Tied-on fall arrester device with shock absorber and with 136 kg maximum work load, ideal for use with stainless steel cable Ø 8 mm. 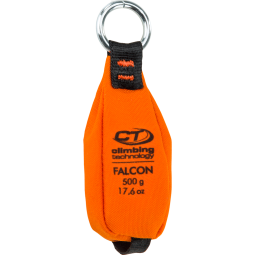 Flexible vertical fall arrest line equipped with a PATRON PLUS 11 rope and a BIG connector with maximum aperture of 60 mm. Flexible vertical lifeline equipped with WORKSMAN EVO 11.0 rope and a GIANT connector with maximum aperture of 110 mm. Flexible vertical fall arrest line equipped with a connector with metal ring and maximum aperture of 60 mm. Telescopic pole to allow positioning and removal of HOOK LIFELINE temporary lifeline. Telescopic pole from 2,4 to 10 m with special mounting for connectors for BIG LIFELINE and GIANT LIFELINEe. Telescopic pole with a maximum length of 10 m that ia equipped with compatible hooking supports for the LARGE and D-SHAPE connectors. Telescopic pole from 1 to 2.8 m equipped with built-in temporary lifeline with terminal connector with maximum opening of 60 mm. Throw bag with a compact form, ideal for the manual throwing, and equipped with an upper small metal ring and a lower sling loop.